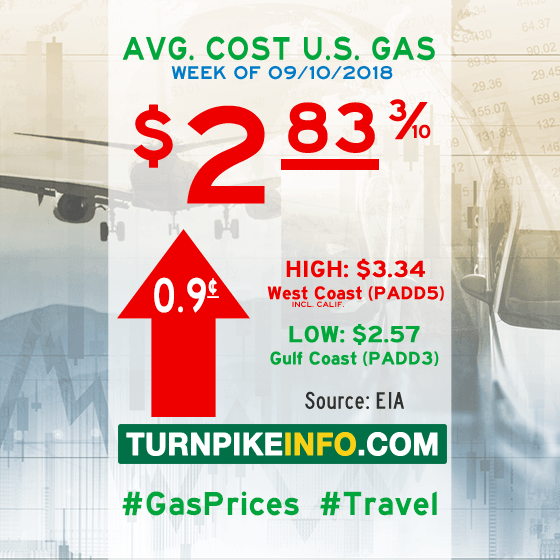 Fort Lauderdale, FL – Gas prices are trickling higher for most drivers across the United States, according to the latest weekly fuel price survey from the U.S. Energy Information Administration. The E.I.A.’s weekly survey shows the cost of gas moved slightly higher this week, about a third of a penny, on average, but not enough to change the nation’s average gas price, which remains $2.84 per gallon. Prices by region swung in different directions, according to the weekly survey. Across much of the East Coast, drivers experienced price declines of between one and two cents per gallon. The dip in retail costs was more than two cents per gallon across the Lower Atlantic, according to E.I.A. figures. However, drivers across the Midwest were socked with another stiff price hike, this time nearly three cents per gallon, on average, adding to a spate of weekly price increases in that region. Diesel prices increased by about a third of penny per gallon, on average, according to the E.I.A. As with regular gas, the national average did not move, remaining at about $3.27 per gallon. This week’s average fuel prices for all regions are shown below, as gathered from www.eia.gov. Fort Lauderdale, FL – Gas prices continue an upward trek into the waning days of summer, as detailed in the latest figures released by the U.S. Energy Information Administration. The E.I.A. reports the cost of regular unleaded pushed upward by nearly a penny per gallon, on average, to $2.84. The figures are included in the E.I.A.’s weekly fuel price survey. Prices were up in all regions, save for the Gulf Coast, where prices fell by over a penny. However, price increases were relatively modest across the East Coast, where many drivers saw prices remain mostly flat. However, the Midwest, with a history of volatile price swings, outpaced the rest of the nation this week, as prices in that region moved more than two cents higher per gallon, on average. State by state, Ohio and Colorado had some of the strongest price increases this week, the E.I.A. reported. In Ohio, nestled in the heart of the Midwest, prices shot up by about a nickel per gallon. That increase was led in part by strong price hikes across Cleveland, where increases were as much as seven cents per gallon. Diesel prices increased by about a penny per gallon this week, according to the E.I.A. The average price for a gallon of diesel is now about $3.27. This week’s average fuel prices for all regions are shown below, as gathered from www.eia.gov. Fort Lauderdale, FL – The nation’s gas prices pushed higher this week, significantly in some regions, helping jostle the national price average by nearly a full penny, pushing the average cost for a gallon of regular unleaded to $2.83, according to the U.S. Energy Information Administration. Prices were up in all regions, but prices moved at twice the pace of the national average across the Central Atlantic, and at more than twice the national average across the Gulf Coast. Prices are detailed in the E.I.A.’s weekly fuel price survey. Diesel prices increased this week, following in the step of last week’s steep increase in prices; but, this week’s price increase was comparatively tame. The average price for a gallon of diesel, according to the E.I.A., went up little more than a half-penny per gallon, enough to push the rounded-average from $3.25 to $3.26. This week’s average fuel prices for all regions are shown below, as gathered from www.eia.gov. Las Vegas, NV – The nation’s average gas prices settled somewhat lower this week, according to the U.S. Energy Information Administration; however, prices from region to region were mixed, by the data in this week’s fuel price survey. The E.I.A. reports the current national average gas price is just over $2.84 per gallon of regular unleaded. This week’s average fuel prices for all regions are shown below, as gathered from www.eia.gov.